KUALA LUMPUR, Malaysia, Dec. 18, 2018 /PRNewswire/ — Kuala Lumpur’s Sunway Resort Hotel & Spa’s Family Fun Package for two (2) adults and two (2) children offers an exciting prospect for an activity-filled break for the whole family. Located just 25 minutes from Kuala Lumpur city centre, within the vibrant 800-acre Sunway City, the integration destination offers a collection of 1,433 guestrooms, suites and pool villas within the flagship Sunway Resort Hotel & Spa, Sunway Pyramid Hotel and Sunway Clio Hotel, in addition to a host of leisure pursuits and facilities that combine to make it a truly memorable family vacation. The Family Fun package offers guests a selection of a 2 days 1 night stay up to 6 days 5 nights with rates starting from MYR782 for two (2) adults and two (2) children below the ages of 12, inclusive of one (1) complimentary rollaway bed, complimentary welcome drinks and daily buffet breakfast. An exclusive privilege for guests of this package includes entry tickets for two (2) adults and two (2) children aged 12 and below to Sunway Lagoon theme park with multiple re-entry on the same day. For guests who book the 5 days 4 nights and 6 days 5 nights package, they will receive tickets for two (2) days to the theme park. The Family Fun Package is valid until 31 December 2019. Rates are quoted in Malaysian Ringgit (MYR) subject to 6% service tax. Additionally, MYR10 Tourism Tax (TTx) will be imposed on all hotel room rates on a per room per night basis to all non-Malaysian guests. Terms and conditions apply. Sunway Resort Hotel & Spa Cluster of Hotels comprise of three (3) hotels within a single destination – the flagship Sunway Resort Hotel & Spa, Sunway Pyramid Hotel and Sunway Clio Hotel with a choice of over 1,433 guestrooms, suites and villas; coupled by a host of facilities including access to the Hotel’s free-form landscaped swimming pool with a cascading waterfall and breath-taking surroundings, as well as a fitness centre overlooking the poolside complete with an aerobics studio and the latest fitness equipment, Sunway Resort Hotel & Spa provides endless hours of leisure for guests seeking relaxation. For family-holiday goers, Sunway Pyramid Hotel offers larger accommodation with the Family Room; suitable for those travelling with young children for its vibrant interiors and a bunk bed. Whereas the Family Suite, measuring between 53 square-metres to 60 square-metres, is the hotel’s largest rooms offering comfortable spaces, with added extras like two (2) bathrooms, a mini refrigerator, a microwave and extra bedding options. The package which incorporates endless fun for the family at Sunway Lagoon theme park offers over 90 rides and attractions spread across its six (6) signature parks – Water Park, Extreme Park, Amusement Park, Wildlife Park, Scream Park and the Nickelodeon Lost Lagoon – the first Nickelodeon themed land in Asia. Among the attractions within the theme park includes the world’s highest, largest and most thrilling water ride, the Vuvuzela, Malaysia’s first permanent bungee jump by AJ Hackett, the country’s first surf simulator – the FlowRider and the World’s First Waterplexx 5D. Retail therapy enthusiasts will be amazed by the selection at Sunway Pyramid Mall. Directly connected to the hotels, the mall is home to over 900 specialty stores, 170 food and beverage outlets, entertainment centres, and recreational facilities like an ice skating rink, 48-lane bowling alley, 12-screen cineplex and much more. 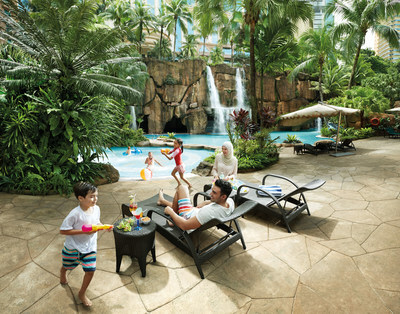 BOOK DIRECT & SAVE: Catch a #BigLittleBreak now and be rewarded when booking directly on http://www.sunwayhotels.com. Guests will enjoy a special rewards pack containing shopping and dining vouchers for Sunway Pyramid Mall worth over MYR2,000. For enquiries or room reservations, please call: +603 7492 8000, or call toll-free (Malaysia Only) at 1-800-82-8888, e-mail: srhs.reservations@sunwayhotels.com or book directly on https://www.sunwayhotels.com. Sunway Resort Hotel & Spa Cluster of hotels are located at Persiaran Lagoon, Bandar Sunway 47500 Selangor Darul Ehsan, Malaysia. Sunway Hotels & Resorts, the hospitality division of leading Malaysian conglomerate, Sunway Group, operates and manages 11 hotels and resorts in Malaysia, Cambodia and Vietnam, representing a collection of over 3,300 guestrooms, suites and villas. The hotel group’s diverse portfolio of hospitality assets and services includes ownership and management of cluster of hotels with large scale convention, meeting and exhibition facilities in an integrated resort city, to private villa destination, a wellness retreat and a portfolio of 5, 4 and 3-star hotels in mixed-use developments. For more information, please visit www.sunwayhotels.com.